This recipe makes a great addition to an Italian themed meal, or just on its own as a snack to share with friends. 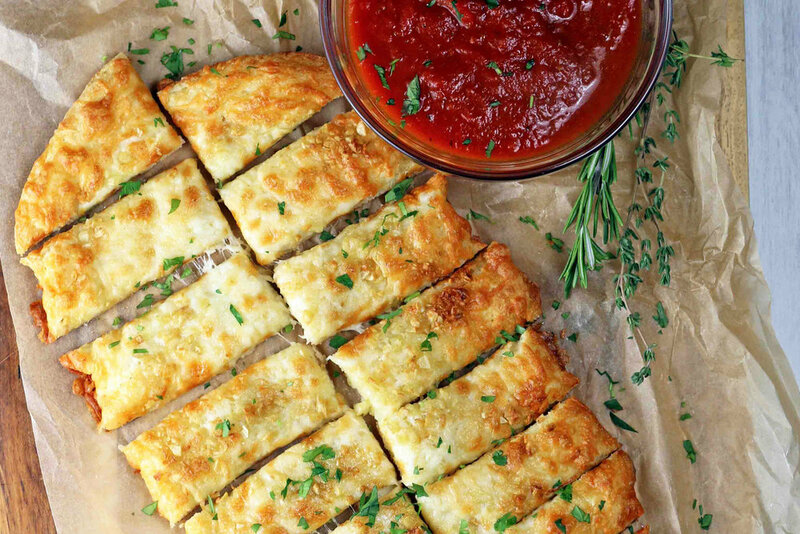 The bread is soft yet crispy and oozing with melty cheese and a buttery garlic flavor, serve with warm, store bought (low sugar) marinara sauce to dip and watch this disappear very quickly. 2. Place almond flour, salt and baking powder into a mixing bowl and mix thoroughly using a whisk. 3. Place a large saucepan over low heat, add the butter, parmesan and mozzarella cheese. Stirring constantly, melt butter and cheese, they may look a little separated at this point, but that won’t be a problem once mixed with the other ingredients. 4. Pour the melted cheese and butter mixture into the bowl of a standing mixer, and using the paddle attachment mix on a low speed, add the almond flour mixture and eggs and turn the speed up to high. Continue to mix for 1-2 minutes until you have a smooth soft dough. Alternatively, this can be done using an electric hand whisk or good old-fashioned elbow grease, but a standing mixer works best. 5. Allow to cool slightly before rolling out, flatten the dough into a rectangle about 12 inches 8 inches directly onto parchment paper. 6. Sprinkle half the gruyere and cheddar cheese over half of the dough. Fold over and press down, crimping the edges together with your fingers. 7. To make the garlic butter, place the butter and garlic into a saucepan and place on a medium heat. Cook for 3-5 minutes until the garlic is aromatic. Pour over the dough and top with the remaining cheese and place into the oven to bake for 20 minutes until golden brown and crispy. 8. Once the garlic bread is cooked cut into sticks and serve with your favorite store bought (low sugar) marinara sauce.